jen has created another lovely block for us this month. And the colour is purple. So many little girls seem to like purple better than pink these days. Did Frozen have anything to do with that? I will freely admit that with two Grandsons I have limited access to little girls and their opinions. So here is my block. As you can see it is a simple block that does not take long to put together once the components are stitched. I was trying for an "arty" shot with the blocks lying on the Heather we have growing at the front of the house but the Heather is on its way out for this year. The first photo I took of the blocks was in very early morning light and somewhat in the shade. I am adding this to show what a difference lighting can make to your pictures. This one looks more like blue and something faded. I am still learning a lot about taking photos. I follow a number of Book Publishers on Facebook. Reading is my number two hobby behind quilting. And if it comes to something portable a book fills the bill perfectly for me. Many of the Publishers offer contests for an opportunity to read a book ahead of the scheduled publication date. These books are then referred to as Advance Reader's Edition or Advance Reader's Copy. 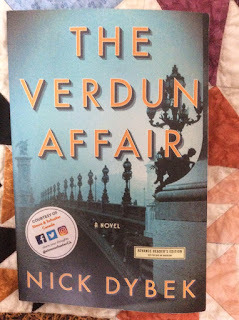 The Verdun Affair is the first book that I "won" in one of these contests. I will freely admit I am not likely to select a war story as my first choice for reading material but this one was different. The story is set in two primary locations and two different time periods. The story begins in post world War I Europe, mainly Italy and France and winds up in 1950 in Los Angeles. Three individuals are all connected to a soldier who experiences severe amnesia following the war. He is situated in a hospital and it is there that the three main characters try to interact with him. Each wishing he is a specific person for their own reasons. There is romance, history and just plain good writing in this book. At the conclusion of the novel, Nick Dybek, the author provides an annotated list of some of the sources he used as he wrote the book. These are added value as for me it is a time period about which I could learn so much more. I love playing with scraps. The rewards are endless and so are the scraps. 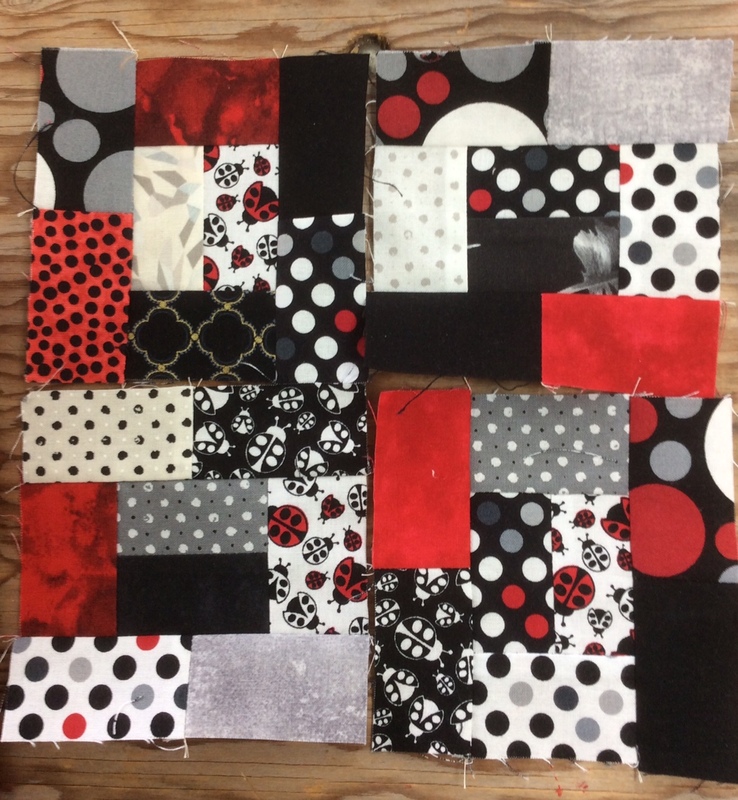 I have been collecting some red, white and black with a tiny bit of grey scraps lately. they were small so I cut them into small bricks (1 1/2" x 2 1/2") and after I finished some must do sewing I started a new Simple Bricks top. The little blocks currently stand at 4 1/2" square. This is a small grouping to show how I put them together. I like to pair them first and them put four together. Once I have that together I lay those out as blocks. It just makes fewer pieces to handle and when you join the pairs together it gives you an opportunity to try to ensure you do not have two pieces the same beside each other. 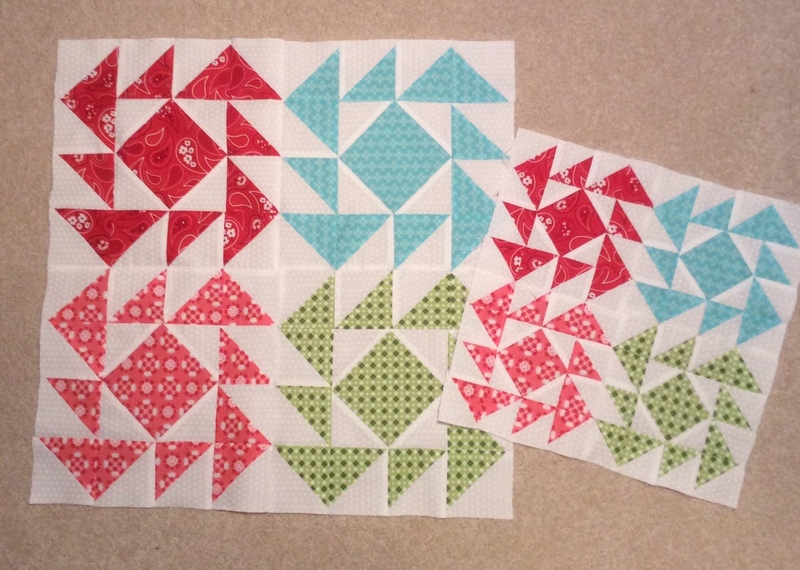 Of course with any multi piece quilt top this isn't always possible but using these steps helps. In the evenings I have been reading an Advance Readers Copy of a book that is being published in June. The title is The Verdun Affair. It is set in two time periods and two main geographic areas. The story begins just after World War One in Italy and continues in 1950 in Los Angeles. I am generally not a big fan of war stories but like The Alice Network this story presents something different. the author has included a list of many of the books he used as reference material for those wishing to explore this era further. And the secret sewing continues but it is secret so no talk or photos. I am heading out later this week for a few days of sewing with some friends. It is always nice to spend time with like minded individuals. Another great block. This time a Square in a Square and some Half Square Triangles are used to build the design. Once again the block is provided in two different sizes. The smaller size finishes at 12" and the larger one at 20". So the larger one with just a couple of borders could make a small Project Linus quilt. So much potential. 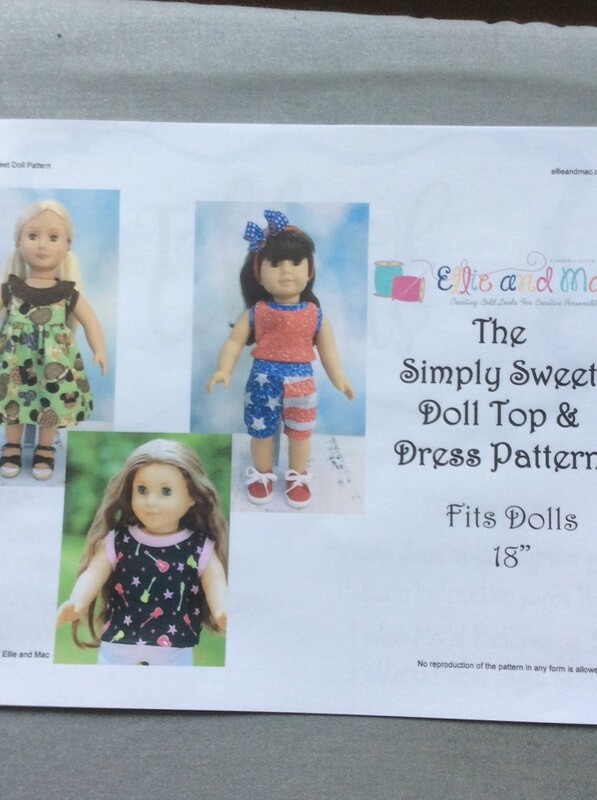 Stop by the Fat Quarter Shop (here) to get your pattern. 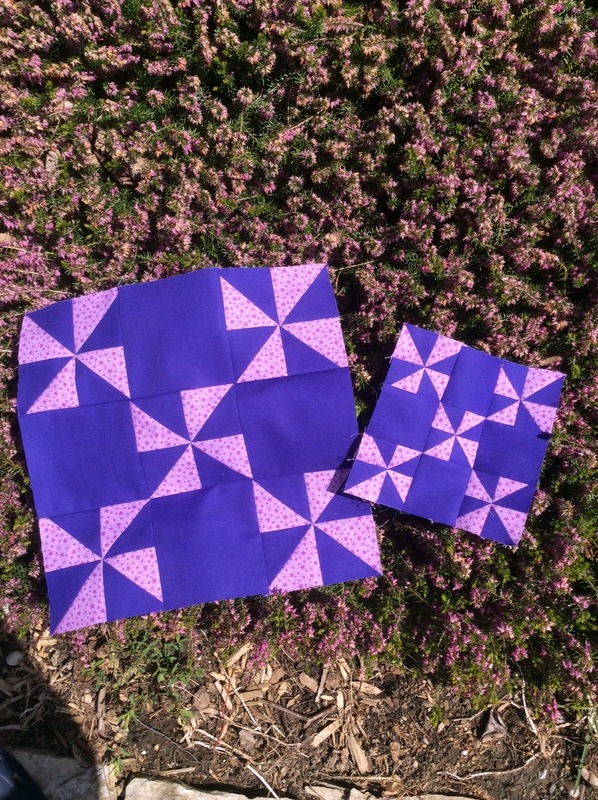 Remember the patterns are free for a voluntary donation to St. Jude's Children's Hospital. 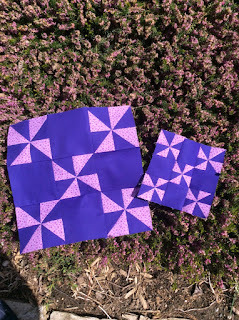 If you are on Instagram take the time to look at what some of the other members of the Quilt Along group are doing with their blocks. Several are using the Fat Quarter Shop's kit, as I am, but several others have branched out into either other collections or colourways that have special meaning to them. I am fortunate to be joining a group of serious sewing bloggers as they show you summer patterns from Ellie and Mac. As one who likes to put my usual spin on things I decided that the dolls in the house need to get ready for summer too. My next door neighbour's grand-daughter was kind enough to loan me her 18" doll (briefly I might add) so that I could make my interpretation of the Simply Sweet Doll Top. The first problem I encountered was a lack of knit fabrics in my stash. And as someone who does very limited online shopping and has absolutely no shop within a two hour drive that sells appropriate knits I switched to a woven and mildly altered the pattern. A bit about the pattern first. It is fantastic. If you are just starting out the detail in the instruction is wonderful. This pattern could be tackled by a beginner as the instructions are so well laid out and so clearly illustrated. The pattern is lengthy but well worth it in the detail it provides. I made the top only as the doll's owner was anxious for her return. 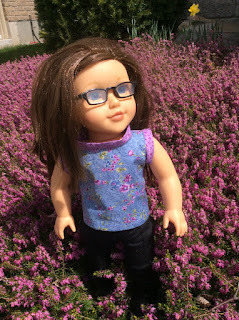 If you are able to use a knit fabric then the top or the dress will fit over the doll's head. A woven will not stretch enough to do that so I cut it up the back and added a velcro closing. So here she is for her stylized photos. Long pants and boots because it is tick season but a lovely comfortable sleeveless top. 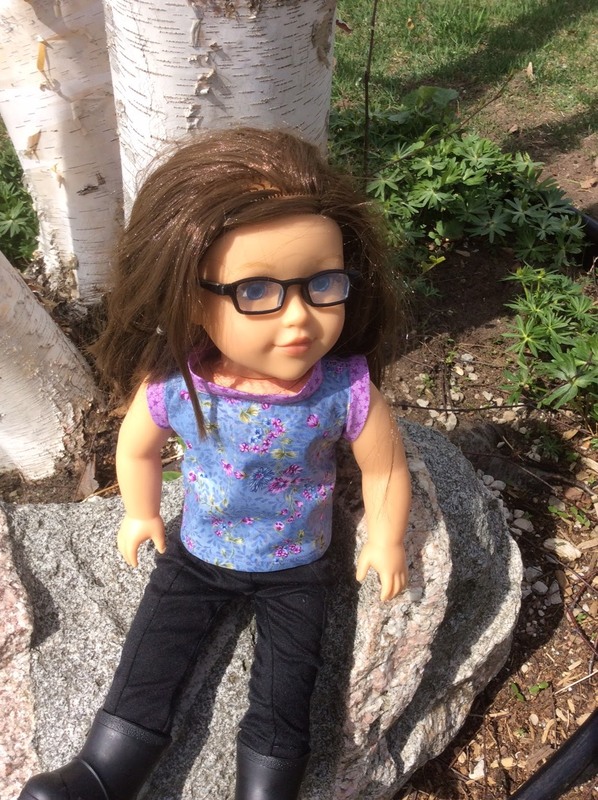 I love that just like her owner the doll wears glasses. 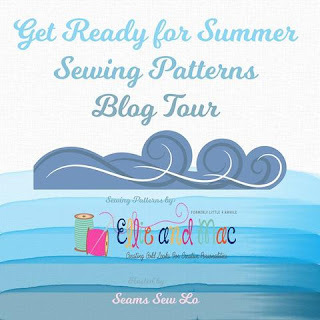 I hope as you visit the other bloggers on this blog hop that you will get all kinds of great new ideas for summer sewing. 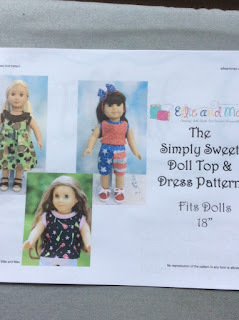 Be sure to visit the other bloggers who have made interpretations of Ellie and Mac designs to help you get ready for summer sewing. The list below identifies my fellow bloggers and their date on the blog hop. Where oh where is the green in our surroundings? For now in our neck of the woods it is in the fabric. So this month we get to break into our green stash. And just a light and a dark are needed to create the blocks that Jen has designed for May. Both easy blocks and they take no time to pull together. I hope you are finding that just one block a month, or two if you think of big and little is not too much to keep up with. I am certainly having a good time playing with mine. 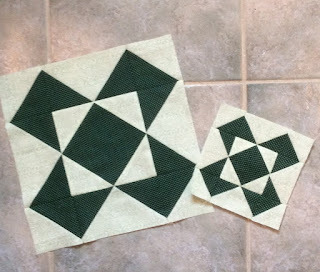 And be certain you drop by the other designers blogs and see what they are offering for their green blocks.